Vientiane, located in the Mekong Valley, is the small, quiet and picturesque capital city of Laos. This friendly capital, studded with crumbling French mansions, bougainvillea-blooming streets and steaming noodle stalls will soon make you feel at home. Vientiane is also a place for passionate pedestrians – it can be easily and pleasantly explored on foot. This is a city full of surprises! Ansara is a charming small boutique hotel located within walking distance of monasteries, markets, restaurants and the Mekong. The Green Park Boutique Hotel and Resort is a newly opened boutique property in Vientiane. Hotel Beau Rivage Mekong is a quaint accommodation situated just across the street from the Mekong river, in downtown Vientiane, Laos' capital. Built in 1932, the Settha Palace Hotel has been renovated and restored to its former imperial glory. Start out by traveling along the picturesque back roads to Vang Vieng, stopping en route at the famous Ban Keun salt mine to get an insight into the daily working life of the locals. Further, reach the picturesque Nam Ngum, followed by lunch (not included) overlooking a lake. Continue north, halting at Tha Heua, a small village specializing in dried fish, seen hanging in front of the houses. Reach Vang Vieng by mid afternoon, with spare time to visit Tham Jang cave and enjoy panoramic views of Nam Song River and the surrounding karst scenery. Relax the rest of the day, overnight stay at hotel. 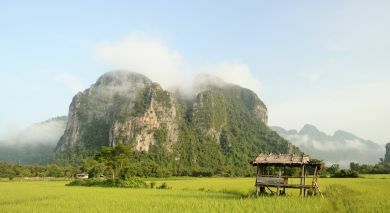 Today, visit Tham Jang cave and enjoy panoramic views of Nam Song River and the surrounding karst scenery. Set forth to Vientiane, stopping en route at Tha Heua, a small village specializing in dried fish, seen hanging in front of the houses. Continue to picturesque Nam Ngum, followed by lunch overlooking a lake. Next, stop at the famous Ban Keun salt mine and get an insight into the daily working life of the locals. The final stop is at Don Makai Market – an insect market, just outside of Vientiane, makes for an interesting experience for the more adventurous who are willing to try the ‘snacks’ on offer! Arrive in Vientiane by early evening. Day 1 – Vientiane – Flight to Phonsavan – Plain Of Jars Enjoy a two day trip to Phonsavan, meaning ‘hills of paradise’, to visit the Plain of Jars. Travel from your hotel to board a direct flight to Phonsavan. On arrival, visit the Mines Action Group (MAG) office; learn how they work to clear land mines and unexploded ordinances/shells in the area. Transfer to Jar Site 1 (the largest site), and Jar Site 3, located atop a hill offering great views of the surrounding countryside. Spent overnight in Phonsavan. 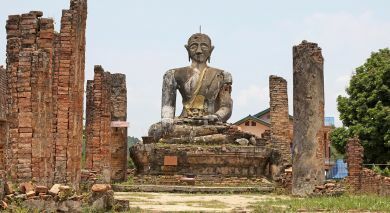 ================================================= Day 2 – Phonsavan – Muang Khoun – Luang Prabang by Road Start out early morning to visit the interesting Central Market, followed by a drive to the ancient town of Muang Khoun, the former provincial capital. 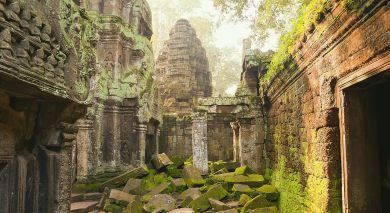 Here you will explore the ruins of several ancient pagodas in Lanna style, and visit Wat Phiawat, a ruined temple containing a huge sitting Buddha. Thereafter, begin a long, but very scenic drive to Luang Prabang. En route you can stop at Ban Somboun, a picturesque Hmong village. Lunch is in the small market town of Phou Khoun, where you can visit Ban Kiu Kharm Pom, a friendly Khmu village, and Ban Nam Ming, offering lovely views from its bridge. Arrive in Luang Prabang by early evening. Embark on an exploration of Vang Vieng en route from Vientiane to Luang Prabang with a 2D/1N trip. Day 1 (Vientiane-Vang Vieng): Start out by traveling along the picturesque back roads to Vang Vieng, stopping en route at the famous Ban Keun salt mine to get an insight into the daily working life of the locals. Further, reach the picturesque Nam Ngum, followed by lunch (not included) overlooking a lake. Continue north, halting at Tha Heua, a small village specializing in dried fish, seen hanging in front of the houses. Reach Vang Vieng by mid afternoon, with spare time to visit Tham Jang cave and enjoy panoramic views of Nam Song River and the surrounding karst scenery. Relax the rest of the day, overnight stay at hotel. Day 2 (Vang Vieng-Luang Prabang): Leaving Vang Vieng early morning, make a brief photo stop at Phatang Mountain view point, offering amazing scenery. Optionally, you can stop at Koe Kuang, boasting a local forest market offering edible snakes, rats and assorted reptiles – if you are adventurous enough to stomach it! Also, visit Ban Hin Ngon, a picturesque Hmong village, before arrival at Phou Khoun for lunch. Post lunch, reach and explore Ban Kiu Kam Pone, a Khmu village. Enjoy the opportunity to stretch out at Ban Nam Ming, a picturesque riverside village. Arrive in Luang Prabang by late afternoon.